Lehrter Street Prison, Berlin. Bavarian Social Democratic politician and trade union activist Ernst Schneppenhorst — who spent most of the war years under detention — was executed by the SS. Moritz Police Barracks, Berlin. While most petty criminals being held by the police were released as the war’s conclusion drew near, an exception was made for four gay policemen. Otto Jordan, Reinhard Höpfner, Willi Jenoch and a man named Bautz were, instead, summarily shot at Berlin’s Moritz police barracks. In 2011, a memorial plaque honoring the four was installed near the place of their execution. Regensburg. 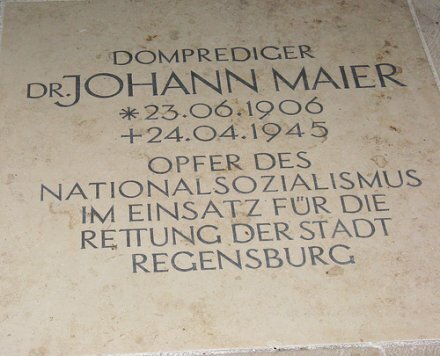 The pastor of Regensburg Cathedral, Dr. Johann Maier, was hanged here for participating in the previous day’s public demonstration begging the Nazi government to surrender to approaching American forces in order to minimize destruction. Rather than let him enumerate his reasons, the divinely ordained authority seized him on the spot and hauled him away for a summary trial that night, followed by a hanging and gibbeting the following morning. A pensioner who protested Maier’s arrest was hanged alongside him, while a policeman who argued the point at the foot of the gallows was promptly shot there and demonstratively laid out to make the group a trio. Johann Maier’s grave market in the city cathedral. Image (c) Adam Maroney, and used with permission. Somewhere in Southern Germany. The Canadian Broadcasting Corporation aired a story on this date attributed to no exact date or locale reporting on the recent, routine execution by the U.S. army of a German civilian believed to be a spy. It seemed like an innocent enough offer at the time. A friendly German civilian approached soldiers from the U.S. 7th Army, offering to help set up a civilian government. But he broke down after being questioned, admitting he was a spy bent on sabotage. The spy was executed, but that wasn’t the end of trouble for the advancing U.S. army, says CBC correspondent Sam Ross, reporting on developments for the U.S. troops. Remaining pockets of German soldiers are now attempting to ambush the Americans. Nevertheless, the U.S. 7th has managed to take some prisoners from the German People’s Army, the Nazis’ last-ditch militia composed of very young and very old men. And there are other people to contend with on the roads behind Allied lines; German civilians are returning home after fleeing from war, and displaced persons freed from forced-labour camps are heading home on foot to Russia, Belgium, Poland and France. From the Themed Set: The Death Rattle of the Third Reich.